Klotho and renal transplant. A better understanding of the potential effects of Klotho on renal transplant may offer novel insights into ameliorating renal allograft injury. In humans after 40 years old, serum levels of α-Klotho, the major form of circulating Klotho, decrease with age.11,12 A decrease in Klotho may result in aging-related diseases, including hypertension,13,14 diabetes,15 chronic kidney disease (CKD),16,17 neuro­logic disorders,18,19 and cardiovascular diseases.20 However, research on the role of Klotho in the field of kidney transplant is so far insufficient. Recent studies have revealed that Klotho showed high relevance in ischemia/reperfusion injury and renal allograft function,21,22 suggesting that further studies about Klotho are of importance and beneficial in understanding kidney transplant. In this review, we will concisely introduce and review the research progress of Klotho in kidney transplant and discuss its potential role in the renal allograft. The klotho gene locus is located on chromosome 13 in humans, and there are 5 exons and 4 introns in the coding region. The gene has been reported to encode α-Klotho, β-Klotho, and Klotho-related protein. Many organs express Klotho protein, including kidney, brain, liver, and parathyroid gland. The kidney is the main source of Klotho and the principal organ mediating Klotho’s effects.24 In the transmembrane form, the functional role of Klotho in kidneys has been proposed as a coreceptor for fibroblast growth factor 23 (FGF-23).2 In proximal and distal renal tubules, membrane-bound Klotho and FGF-23 form a complex in the basolateral membrane. In proximal renal tubules, Klotho independently activates extracellular signal-regulated kinase 1/2 and serum/glucocorticoid-regulated kinase 1, leading to phosphorylation of the scaffolding protein sodium/hydrogen exchange regulatory cofactor 1 and subsequent internalization and degradation of sodium-phosphate cotransporters, thereby resulting in suppression of phosphate reabsorption by FGF-23. In distal renal tubules, Klotho independently activates with-no-lysine kinase 4 (WNK4), after which FGF-23 augments calcium and sodium reabsorption by increasing the apical membrane expression of the epithelial calcium channel transient receptor potential vanilloid (TRPV5) and of the sodium-chloride cotransporter. Through the above mechanisms, Klotho shows renal protective effects on proximal tubular phosphate reuptake, proximal tubular vitamin D hormone synthesis, and distal tubular calcium and sodium transport.25 The contribution of extrarenal Klotho to renal protection remains to be confirmed (Figure 1). Regarding long-term renal transplant results concerning Klotho, Bleskestad and associates reported reduced soluble Klotho levels compared with levels in healthy volunteers, although the result was not significant, and a trend toward lower levels of serum Klotho compared with levels shown in a control group matched for eGFR.22 These data support results from animal studies that the kidneys are a major resource of soluble Klotho. Both short-term and long-term renal transplant recipients exhibited lower serum Klotho levels compared with controls. Although reasons are not clear, these changes could be due to AKI and immuno­suppressant toxicity. Further studies are required to better elucidate the associations between serum Klotho levels and renal graft outcomes. Considering the critical role of Klotho in preventing cellular senescence, Klotho expression may play a central role in prolonging renal allograft survival. However, this hypothesis remains to be illuminated. Factors modulating Klotho expression in renal transplant are not fully understood in clinical practice. So far, few studies have been conducted to clarify this unknown in the area of renal transplantation. Paricalcitol, a commonly used drug for CKD patients with hyperparathyroidism, was found to elevate serum Klotho concentrations in renal transplant recipients with secondary hyperparathyroidism with an increment in klotho expression in peripheral blood mononuclear cells.45 Similar effects were observed with recombinant human erythropoietin both in vitro and in vivo. Leone and colleagues verified that recombinant human erythropoietin pretreatment mitigated Klotho downregulation in HK-2 cells induced by cyclosporine treatment and modulated a trend toward higher serum Klotho levels compared with healthy individuals.46 Rapamycin, which is used to prevent graft rejection after renal transplant, induced increased klotho gene and protein expression levels via mTORC2 activation both in vitro and in vivo.47 These potential factors modulating Klotho expression need further investigation to verify their potential role in prolonging renal allograft survival. Recently, a commentary48 raised an unanswered question: will intervention via the FGF-23/Klotho axis improve kidney transplant outcomes? Klotho has been shown to participate in several intracellular signaling pathways. The FGF-23/Klotho signaling pathway is involved in mineral homeostasis, vitamin D synthesis, cell proliferation, and cell apoptosis in the kidney. Klotho also protects renal tubular cells from oxidative damage by inhibiting the insulin/IGF-1 signaling pathway and inhibits transforming growth factor β1 for decreasing renal fibrosis. Activation of the protein kinase C signaling pathway by Klotho results in suppression of the 25-hydroxyvitamin D3 1α-hydroxylase gene in renal cells. Klotho is also involved in Wnt signaling pathways involved in renal fibrosis10 (Figure 2). In the kidney transplant setting, a Klotho-related signaling pathway has not been confirmed. Theoretically, the antiaging properties and pleiotropic effects of Klotho could delay renal allograft aging and ameliorate immune and nonimmune injury. Indeed, in an animal study investigating how to switch the Klotho effect to clinical utility for prolonging renal allograft survival, Doi and colleagues confirmed that administration of secreted Klotho protein suppressed mouse renal fibrosis. The group also showed that secreted Klotho protein directly binds to the type II transforming growth factor (TGF)-β receptor and inhibits TGF-β1 binding to cell surface receptors, thereby inhibiting TGF-β1 signaling.49 In rats, administration of cyclosporine reduced renal and serum Klotho expression levels. However, Klotho downregulation was prevented by valsartan, a renal protective drug, thereby alleviating cyclosporine-induced nephrotoxicity.50 Similar results were shown by Piao and associates, in which N-acetylcysteine preserved Klotho expression and relieved chronic cyclosporine nephropathy via the phospho-AKT/phospho-FoxO1 pathway in mice.51 So far, the effects of Klotho in a renal allograft animal model has not been shown, and it remains to be confirmed whether Klotho plays a critical role in prolonging renal allograft survival in animals (Table 1). Because of organ shortages, the use of aging kidneys from expanded criteria donors is on the rise. Interventions to prolong renal allograft survival have long been pursued. Because of its antiaging properties and other physiologic effects, Klotho could be a potential candidate to ameliorate renal allograft impairment. Although Klotho has been shown to be a potential good diagnostic marker and a possible therapeutic choice for some kidney diseases, few studies have investigated its role in renal transplant. Further research is needed to shed light on the intricate mechanisms of Klotho in the field of renal transplant for diagnostic and therapeutic purposes. Additionally, clinical studies containing large samples are required to confirm the long-term effects of Klotho in outcomes of renal allografts. Kuro-o M, Matsumura Y, Aizawa H, et al. Mutation of the mouse klotho gene leads to a syndrome resembling ageing. Nature. 1997;390(6655):45-51. Xu Y, Sun Z. Molecular basis of Klotho: from gene to function in aging. Endocr Rev. 2015;36(2):174-193. Hu MC, Shi M, Zhang J, Quinones H, Kuro-o M, Moe OW. Klotho deficiency is an early biomarker of renal ischemia-reperfusion injury and its replacement is protective. Kidney Int. 2010;78(12):1240-1251. Dermaku-Sopjani M, Sopjani M, Saxena A, et al. Downregulation of NaPi-IIa and NaPi-IIb Na-coupled phosphate transporters by coexpression of Klotho. Cell Physiol Biochem. 2011;28(2):251-258. John GB, Cheng CY, Kuro-o M. Role of Klotho in aging, phosphate metabolism, and CKD. Am J Kidney Dis. 2011;58(1):127-134. Zacchia M, Capasso G. Dehydration: a new modulator of klotho expression. Am J Physiol Renal Physiol. 2011;301(4):F743-744. Kuro-o M. Klotho in health and disease. Curr Opin Nephrol Hypertens. 2012;21(4):362-368. Manya H, Akasaka-Manya K, Endo T. Klotho protein deficiency and aging. Geriatr Gerontol Int. 2010;10 Suppl 1:S80-87. Hu MC, Shiizaki K, Kuro-o M, Moe OW. Fibroblast growth factor 23 and Klotho: physiology and pathophysiology of an endocrine network of mineral metabolism. Annu Rev Physiol. 2013;75:503-533. Sopjani M, Rinnerthaler M, Kruja J, Dermaku-Sopjani M. Intracellular signaling of the aging suppressor protein Klotho. Curr Mol Med. 2015;15(1):27-37. Pedersen L, Pedersen SM, Brasen CL, Rasmussen LM. Soluble serum Klotho levels in healthy subjects. Comparison of two different immunoassays. Clin Biochem. 2013;46(12):1079-1083. Siahanidou T, Garatzioti M, Lazaropoulou C, et al. Plasma soluble alpha-klotho protein levels in premature and term neonates: correlations with growth and metabolic parameters. Eur J Endocrinol. 2012;167(3):433-440. Wang Y, Sun Z. Klotho gene delivery prevents the progression of spontaneous hypertension and renal damage. Hypertension. 2009;54(4):810-817. Satoh M, Nagasu H, Morita Y, Yamaguchi TP, Kanwar YS, Kashihara N. Klotho protects against mouse renal fibrosis by inhibiting Wnt signaling. Am J Physiol Renal Physiol. 2012;303(12):F1641-1651. Mochly-Rosen D, Das K, Grimes KV. Protein kinase C, an elusive therapeutic target? Nat Rev Drug Discov. 2012;11(12):937-957. Maekawa Y, Ishikawa K, Yasuda O, et al. Klotho suppresses TNF-alpha-induced expression of adhesion molecules in the endothelium and attenuates NF-kappaB activation. Endocrine. 2009;35(3):341-346. Rakugi H, Matsukawa N, Ishikawa K, et al. Anti-oxidative effect of Klotho on endothelial cells through cAMP activation. Endocrine. 2007;31(1):82-87. Dehvari N, Cedazo-Minguez A, Isacsson O, et al. Presenilin dependence of phospholipase C and protein kinase C signaling. J Neurochem. 2007;102(3):848-857. Van Sandwijk MS, Ten Berge IJ, Majoie CB, et al. Cognitive changes in chronic kidney disease and after transplantation. Transplantation. 2016;100(4):734-742. Semba RD, Cappola AR, Sun K, et al. Plasma klotho and cardiovascular disease in adults. J Am Geriatr Soc. 2011;59(9):1596-1601. Castellano G, Intini A, Stasi A, et al. Complement modulation of anti-aging factor klotho in ischemia/reperfusion injury and delayed graft function. Am J Transplant. 2016;16(1):325-333. Bleskestad IH, Thorsen IS, Jonsson G, Skadberg O, Bergrem H, Goransson LG. 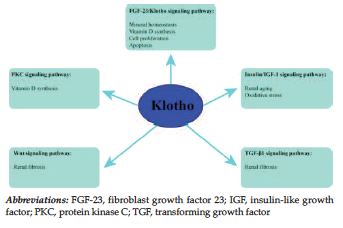 Soluble Klotho and intact fibroblast growth factor 23 in long-term kidney transplant patients. Eur J Endocrinol. 2015;172(4):343-350. Mencke R, Hillebrands JL, consortium N. The role of the anti-ageing protein Klotho in vascular physiology and pathophysiology. Ageing Res Rev. 2017;35:124-146. Lindberg K, Amin R, Moe OW, et al. The kidney is the principal organ mediating klotho effects. J Am Soc Nephrol. 2014;25(10):2169-2175. Erben RG, Andrukhova O. FGF23-Klotho signaling axis in the kidney. Bone. 2017;100:62-68. Wiggins J. Why do our kidneys get old? Nephron Exp Nephrol. 2011;119 Suppl 1:e1-5. Abdel-Rahman EM, Okusa MD. Effects of aging on renal function and regenerative capacity. Nephron Clin Pract. 2014;127(1-4):15-20. Dermaku-Sopjani M, Kolgeci S, Abazi S, Sopjani M. Significance of the anti-aging protein Klotho. Mol Membr Biol. 2013;30(8):369-385. Zuo Z, Lei H, Wang X, Wang Y, Sonntag W, Sun Z. Aging-related kidney damage is associated with a decrease in klotho expression and an increase in superoxide production. Age (Dordr). 2011;33(3):261-274. Yamada K, Doi S, Nakashima A, et al. Expression of age-related factors during the development of renal damage in patients with IgA nephropathy. Clin Exp Nephrol. 2015;19(5):830-837. Quarles LD. Endocrine functions of bone in mineral metabolism regulation. J Clin Invest. 2008;118(12):3820-3828. Kuro-o M. Klotho. Pflugers Arch. 2010;459(2):333-343. Bian A, Neyra JA, Zhan M, Hu MC. Klotho, stem cells, and aging. Clin Interv Aging. 2015;10:1233-1243. 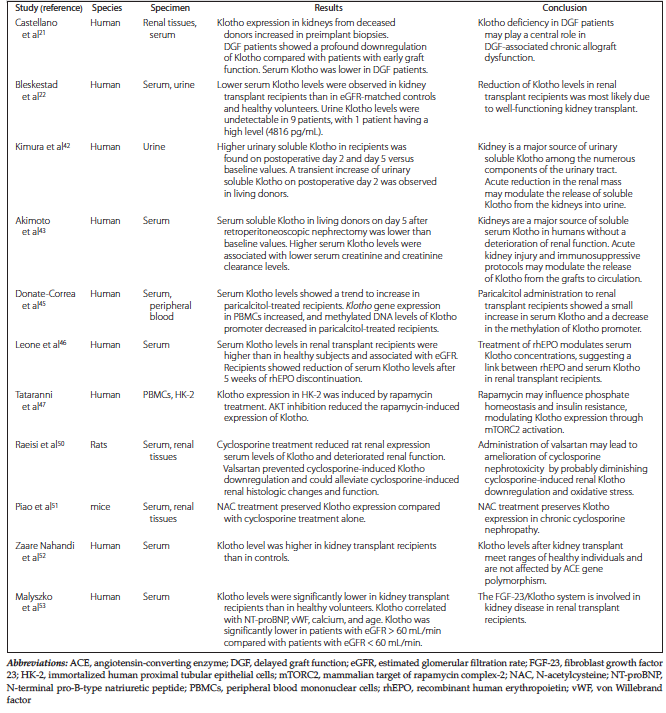 Seibert E, Radler D, Ulrich C, Hanika S, Fiedler R, Girndt M. Serum klotho levels in acute kidney injury. Clin Nephrol. 2017;87(2017)(4):173-179. Seo MY, Yang J, Lee JY, et al. Renal Klotho expression in patients with acute kidney injury is associated with the severity of the injury. Korean J Intern Med. 2015;30(4):489-495. Kalaitzidis RG, Duni A, Siamopoulos KC. Klotho, the Holy Grail of the kidney: from salt sensitivity to chronic kidney disease. Int Urol Nephrol. 2016;48(10):1657-1666. Barker SL, Pastor J, Carranza D, et al. The demonstration of alphaKlotho deficiency in human chronic kidney disease with a novel synthetic antibody. Nephrol Dial Transplant. 2015;30(2):223-233. Pavik I, Jaeger P, Ebner L, et al. Secreted Klotho and FGF23 in chronic kidney disease Stage 1 to 5: a sequence suggested from a cross-sectional study. Nephrol Dial Transplant. 2013;28(2):352-359. Neyra JA, Hu MC. 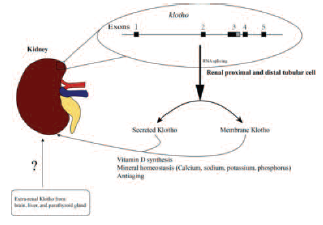 Potential application of klotho in human chronic kidney disease. Bone. 2017;100:41-49. Nankivell BJ, Kuypers DR. Diagnosis and prevention of chronic kidney allograft loss. Lancet. 2011;378(9800):1428-1437. Musso CG, Giordani MC, Imperiali N. Aging Kidney Transplantation. Rev Invest Clin. 2016;68(2):68-74. Kimura T, Akimoto T, Watanabe Y, et al. Impact of renal transplantation and nephrectomy on urinary soluble Klotho protein. Transplant Proc. 2015;47(6):1697-1699. Akimoto T, Kimura T, Watanabe Y, et al. The impact of nephrectomy and renal transplantation on serum levels of soluble Klotho protein. Transplant Proc. 2013;45(1):134-136. Siedlecki A, Irish W, Brennan DC. Delayed graft function in the kidney transplant. Am J Transplant. 2011;11(11):2279-2296. Donate-Correa J, Henriquez-Palop F, Martin-Nunez E, et al. Effect of paricalcitol on FGF-23 and Klotho in kidney transplant recipients. Transplantation. 2016;100(11):2432-2438. Leone F, Lofaro D, Gigliotti P, et al. Soluble Klotho levels in adult renal transplant recipients are modulated by recombinant human erythropoietin. J Nephrol. 2014;27(5):577-585. Tataranni T, Biondi G, Cariello M, et al. Rapamycin-induced hypophosphatemia and insulin resistance are associated with mTORC2 activation and Klotho expression. Am J Transplant. 2011;11(8):1656-1664. Puttarajappa C, Hariharan S. FGF-23 Klotho Axis: Will Intervention Improve Kidney Transplant Outcomes? Transplantation. 2016;100(11):2246-2247. Doi S, Zou Y, Togao O, et al. Klotho inhibits transforming growth factor-beta1 (TGF-beta1) signaling and suppresses renal fibrosis and cancer metastasis in mice. J Biol Chem. 2011;286(10):8655-8665. Raeisi S, Ghorbanihaghjo A, Argani H, et al. The effects of valsartan on renal Klotho expression and oxidative stress in alleviation of cyclosporine nephrotoxicity. Transplantation. In press. doi:10.1097/TP.0000000000001350. Piao SG, Kang SH, Lim SW, et al. Influence of N-acetylcysteine on Klotho expression and its signaling pathway in experimental model of chronic cyclosporine nephropathy in mice. Transplantation. 2013;96(2):146-153. Zaare Nahandi M, Ardalan MR, Banagozar Mohamadi A, Ghorbani Haghjo A, Jabbarpor Bonyadi M, Mohamadian T. Relationship of Serum Klotho level with ACE gene polymorphism in stable kidney allograft recipients. Iran J Kidney Dis. 2017;11(2):151-156. Malyszko J, Koc-Zorawska E, Matuszkiewicz-Rowinska J, Malyszko J. FGF23 and Klotho in relation to markers of endothelial dysfunction in kidney transplant recipients. Transplant Proc. 2014;46(8):2647-2650. Acknowledgements: There are no sources of funding for this study, and the authors have no conflicts of interest to declare.